This case report describes a rare abnormality of the forefoot in an adult who underwent implantation of a ventricular assist device. Toe deformities are not necessarily related to pain and/or functional foot limitations. An underlapping toe is a rarely, described disorder. Ventricular assist devices (VAD) are comprised of a set of tools that allows the system to substitute for the pump function of the heart in eligible patients. A 60-year-old Caucasian man affected by ischemic dilated cardiomyopathy underwent ventricular assist device implantation as a bridge to transplantation. The third toe abnormality reported here did not influence the ventricular assist device implantation or postoperative recovery in terms of exercising. An underlapping third toe can coexist in the presence of debilitating illness without causing particular physical difficulties. Key words: Blood circulation, Forefoot, Gait, Heart transplantation, Quality of life, Rehabilitation, Toes abnormalities. 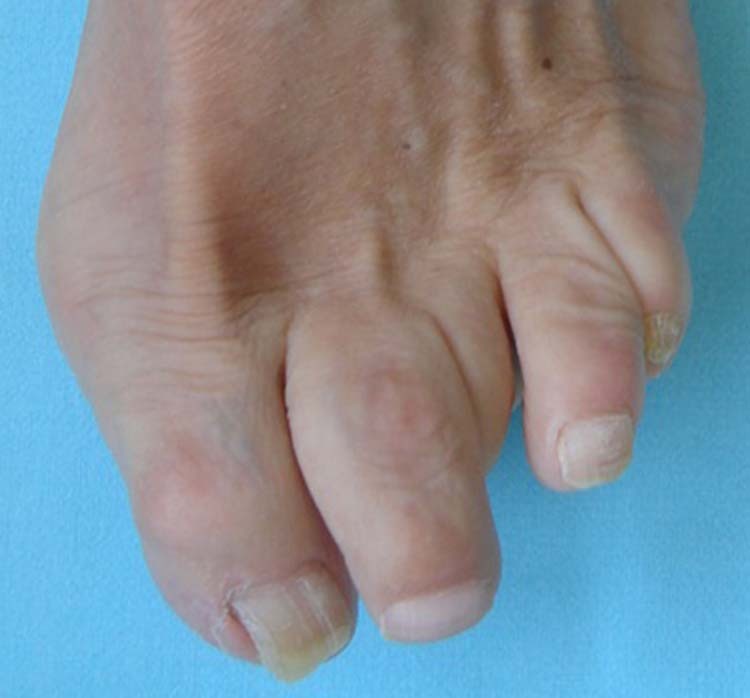 In contrast, an underlapping toe is a rare and little-described disorder. Friend found that the fourth and fifth toes are the most involved in an underlapping toe abnormality even if the second or third toes are also affected. The combination of congenitally elongated toes and an acquired adductovarus is the major mechanism that produces this deformity. Ventricular assist devices (VAD) are comprised of a set of tools that allows the system to substitute for the pump function of the heart in eligible patients. The system is powered by lithium and lead batteries—which have different durations—and is transported in a bag in a horizontal position so as not to cover the microphone alarm. Left ventricular assist devices (LVAD) are an effective strategy to prolong survival and improve quality of life. The Interagency Registry for Mechanically Assisted Circulatory Support has been created to collect information about patients, devices, and outcomes, including adverse events. The main purpose of this report is to describe a rare abnormality of the forefoot in an adult who underwent implantation of a VAD. A 60 year-old Caucasian man affected by ischemic dilated cardiomyopathy underwent LVAD implantation (Jarvik Heart®, New York, NY, USA) as a bridge to transplantation. He had diabetes, dyslipidemia and was an ex-smoker. Figure 1 Standing position. Right side: hallux valgus, hammertoes second to fifth. Left side: hammertoes first to fifth, hallux valgus, underlapping third toe. Figure 2 Dorsal view of the left side: underlapping third toe. Figure 3 Plantar view of the left side: the third toe is medially deviated (two red arrows) and attached to the first (four red arrows). The patient had no difficulties ambulating and was free from pain. Thus, postoperative rehabilitation was centered on recovery of motor activity and reconditioning after the VAD implantation. The first line of the rehabilitative treatment in the sub-intensive setting was focused on encouraging the patient to perform exercises (even in a group) such as cycling, climbing stairs, and walking (even outside the pavilion); the patient’s performance of exercises was monitored. Furthermore, all motor activities were performed in association with respiratory exercises, such as deep breathing and incentive spirometry. The patient provided written informed consent for this study. Similarly, Korn proposed a surgical approach for correction of a painful underlapping fifth toe and reported excellent outcomes of surgery. Fattirolli, et al., discussed the importance of a customized rehabilitation program in patients undergoing VAD to enhance function and the quality of life. A multidisciplinary approach is the ideal solution for long-term care during postoperative recovery. Furthermore, the benefits of exercise training were reported by Bellotto, et al., who discussed the postoperative course of a patient with an implanted artificial heart. Polastri investigated the role of postoperative rehabilitation after hallux valgus surgery, and surmised that a rehabilitative intervention is required to encourage both plantar pressure on the first ray and joint mobility. If these are the objectives of hallux valgus surgery, what is advisable in terms of exercise in a case such as that we report here in which the deformities were not corrected? The answer to this question must consider the rationale of the treatment according to both the condition of the patients and their quality-of-life expectations. In fact, the patient described here was admitted so that his cardiac function issues could be addressed; the feet abnormalities (hallux valgus, hammer toes, and underlapping third toe) were an occasional finding of secondary importance considering his overall condition. The postoperative rehabilitation pathway, particularly in specialized settings, must be appropriate and centered on the patient’s needs with due consideration of their priorities. 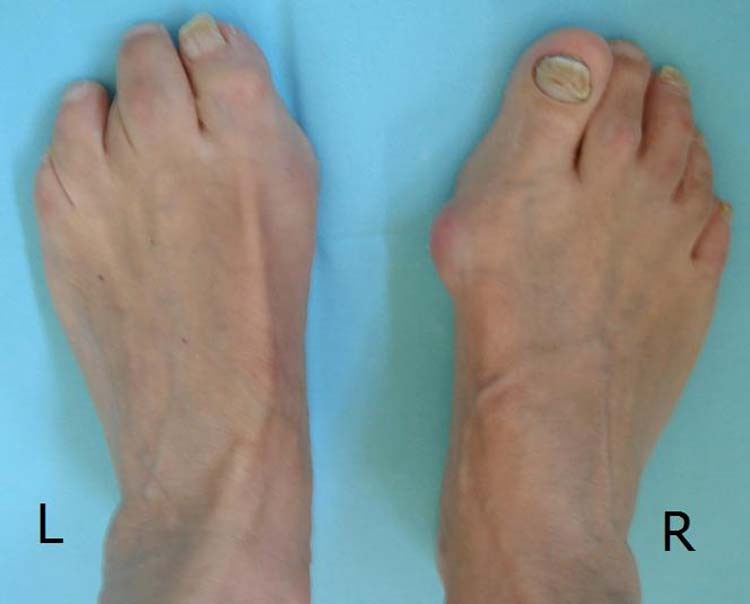 In this regard, the third toe abnormality reported here did not influence the VAD implantation or postoperative recovery in terms of exercising. The main limitation of this case report is the lack of quantification of the foot-joint deformities by means of range-of-motion measurements. However, the aim of this case study was to describe an unusual abnormality that does not require deep investigation. Furthermore, our findings should not be extended to a larger population. Nevertheless, this is to our knowledge the first report of feet deformities in a patient implanted with a VAD. In summary, an underlapping third toe can coexist in the presence of debilitating illness without causing particular physical difficulties. Address correspondence to: Massimiliano Polastri, Physical Medicine and Rehabilitation, Bologna, University Hospital Authority, Sant’Orsola-Malpighi Polyclinic, Via G. Massarenti, 9. 40138 –Bologna, Italy. 1 Physical Medicine and Rehabilitation, Bologna University Hospital Authority, Sant’ Orsola-Malpighi Polyclinic, Bologna, Italy. 2 Cardiac Surgery Department, Sant’ Orsola-Malpighi Polyclinic, Bologna University, Bologna, Italy.